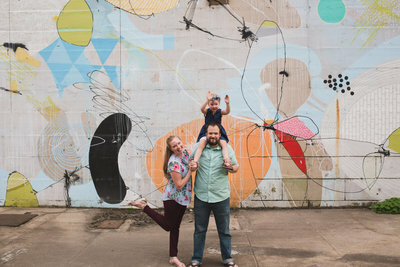 Choosing a location for your family or engagement session can be difficult. The Richmond area offers so many diverse options. And as your photographer, I’m always up for something new and exciting! Consider the distance you’re willing to drive, whether you’ll have small children with you during the session, the weather (seasonally, some locations work better than others), and what you and your partner or family enjoy doing. Because we are lifestyle photographers, we are able to have fun with some creative session ideas. Love to bake with your kids? Let’s have a session at your home where your family bakes together! Live for the thrill of hiking with your fiance? Let’s capture that! Below is a list of some of my favorite locations to use for portrait sessions around Richmond. Have any other ones you love that aren’t on this list? Comment at the bottom! Various murals around Richmond – There are so many good ones to choose from! They make a great background for portraits. Like what you’ve read? Check out our website & follow us on Facebook or Instagram for our latest posts!